My vases are not glass or ceramic. They are constructed from natural stone, bonded with fortified masonry. Selected pieces are carefully worked by hand. I saw, split and break the stone to achieve the desired shape of the vase, leaving attractive, natural looking broken edges. Every vase has my initials etched into the stone. 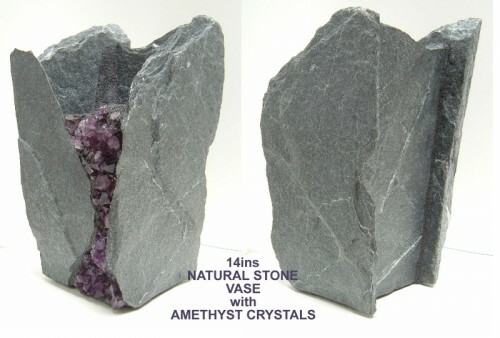 Each vase has one especially decorative face showing exposed aggregates or semi precious minerals and gems. The other three sides are solid rock. The vases are fully waterproof and may be sprayed or immersed in water for cleaning purposes, each has a glass core to ensure that it is completely watertight and will not seep any moisture. Cork pads are added to the base to protect furniture. This particular vase is 12 ins. high and weighs 11 lbs. 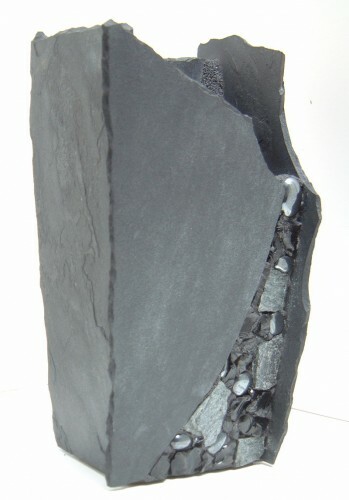 It is constructed from an Indigo-black slate with areas of silver shimmer. 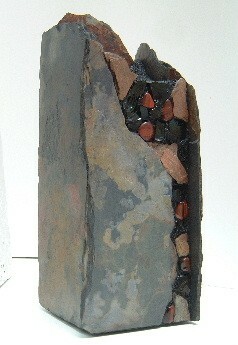 I added a seam of, Hematite, Mica and Obsidian Glass. The price of this vase is 165.00 CDN. Available from my studio or at the Saltspring Saturday market. I also ship my work. You can make a secure online purchase in many currencies from my website, www.vaseguy.com, or by contacting me by email. This is an example of one of my largest vases. It is 18ins. tall and weighs 20lbs. It is constructed from an intensly patterned slate from India. I added a seam of Golden Tiger's eye, Mica and Obsidian Glass. As with all my vases, it is glass lined for perfect function. The price of this vase is 225.00 CDN. Available from my studio or at the Saltspring Saturday market. 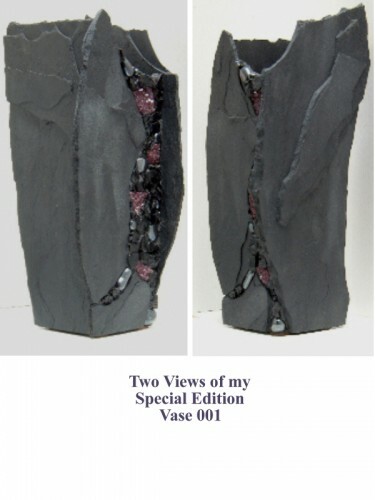 This particular vase is in a metallic blue stone that originated in my own region, the west coast of Canada. It stands 14ins tall at it's highest point and weighs 22lbs. I added a generous vein of Amethyst Crystals. The price of this vase is 325.00 CDN. Available from my studio or at the Saltspring Saturday market. The price of this vase is 125.00 CDN. Available from my studio or at the Saltspring Saturday market. This vase is a in a black stone that edges towards indigo with areas of silver shimmer. I added Obsidian Glass, Hematites and Wine colored Amethyst Crystals. This vase is 17ins. tall and weighs 20lbs. 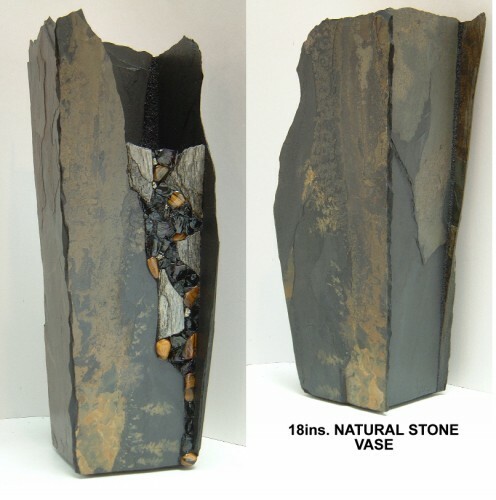 Price $450.00 North American shipping included.This vase may be purchased from my website or can be seen at the Saltspring island market by pre-arrangement. I am generally in the Salt Spring Island Saturday Market during the Summer months.